A bill to allow satellite-TV providers like AT&T Inc.'s DirecTV and Dish Network Corp. to keep sending broadcast TV signals to rural households may lead to broadcast retransmission fee rule changes. The STELA Reauthorization Act is scheduled to sunset at the end of 2019. Lawmakers and industry lobbyists are eyeing a prospective reauthorization measure as a vehicle to alter regulations governing the fees that cable and satellite television providers pay broadcasters to retransmit their programming. The broadcast and cable industries have fought over the negotiated fees for years. 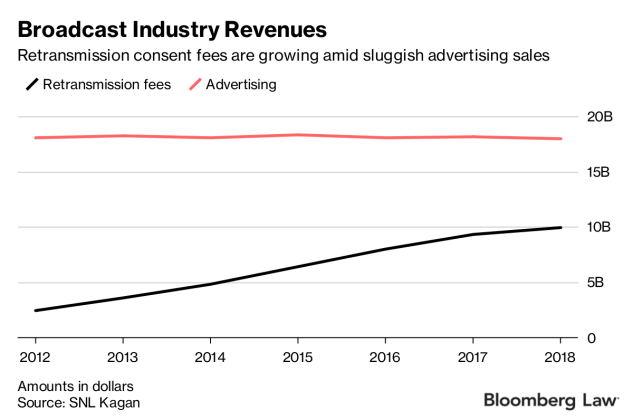 The fees have become a lucrative revenue source for broadcasters that have seen advertising dollars plummet in recent years. Broadcasters’ retransmission fees are expected to grow from $8 billion in 2016 to $10 billion this year, according to SNL Kagan data. Cable and satellite-TV providers, facing strong competition from Netflix Inc., Alphabet Inc.'s YouTube TV and Hulu, want Congress to modernize retransmission regulations that don’t apply to streaming services. Cable subscribers have seen programming blackouts when broadcasters and pay-TV providers fail to agree on fees. Blackouts have become more common as retransmission fees have increased. For instance, Univision channels have been blacked out for millions of Dish subscribers since June 30 because of a retransmission fee dispute between the Spanish-language broadcaster and the satellite-TV provider. Congress has made several changes to retransmission consent rules since they became law in 1992, including banning broadcasters from teaming up with other stations to negotiate programming carriage with pay-TV providers. The ban, which was tacked onto the 2014 STELA reauthorization, was a win for pay-TV providers and consumer groups. They argued the joint negotiations gave broadcasters unfair leverage to extract higher retransmission fees, leading to bigger bills for consumers and more frequent station blackouts. The current law also requires broadcast stations and satellite and cable providers to negotiate retransmission consent agreements in “good faith,” but the FCC has only investigated a handful of disputes. The pay-TV industry will likely press Congress to make more changes to retransmission consent rules, while broadcasters will try to maintain the existing regulatory framework that favors their bottom lines, media industry attorneys said. Trade groups on both sides of the fight are gearing up for the negotiations. “Congress should not only re-authorize STELAR so rural America can continue receiving all their broadcast channels, but also modernize the retransmission consent rules, which currently favor broadcasters at the expense of consumers and competition,” Trent Duffy, a spokesman at the American Television Alliance (ATVA), a group that represents cable and satellite companies and consumer groups, told Bloomberg Law in an email. The ATVA supports legislation by House Republican Whip Steve Scalise (La.) that would scrap the retransmission consent framework. Cable and satellite companies have backed other legislative proposals, such as one floated by Sen. John Thune (R-S.D.) and former Sen. Jay Rockefeller IV (D-W.Va.) in the 2014 STELA negotiations. It would allow broadcasters to charge pay-TV subscribers directly to receive their programming. The proposal, aimed at curbing blackouts from retransmission consent disputes between TV stations and pay-TV providers, wasn’t included in the final bill after a broadcast industry outcry. The National Association of Broadcasters is urging Congress to let the STELA law sunset. The group said in a policy brief to lawmakers that advancements in satellite broadcasting technology have made the law unnecessary. Congress passed the satellite TV provisions to help what were then upstart satellite-TV providers compete with cable companies. Satellite-TV providers are allowed under the law to import broadcast programming from distant TV stations to rural subscribers that don’t receive local broadcast signals. The number of satellite TV subscribers that would lose broadcast programming by the law’s sunset is declining, from about 1.5 million subscribers in 2014 to about 500,000 subscribers this year, according to NAB estimates. Private business arrangements between satellite-TV companies and broadcasters could resolve instances where local broadcast channels aren’t available to subscribers, NAB argued in its policy brief.